I made a little self portrait on an aspen lined hiking path near Bear Lake (9,500 ft) in Rocky Mountain National Park. It's beautiful up in the higher elevations, lots of color, orange, yellow and green. I always like the fisheye view of things, pulled together in a perfect circle. My portrait is in HDR, you can pick up the clues from my tripod, cable release and the inside of the barrel of the lens (it's usually black). 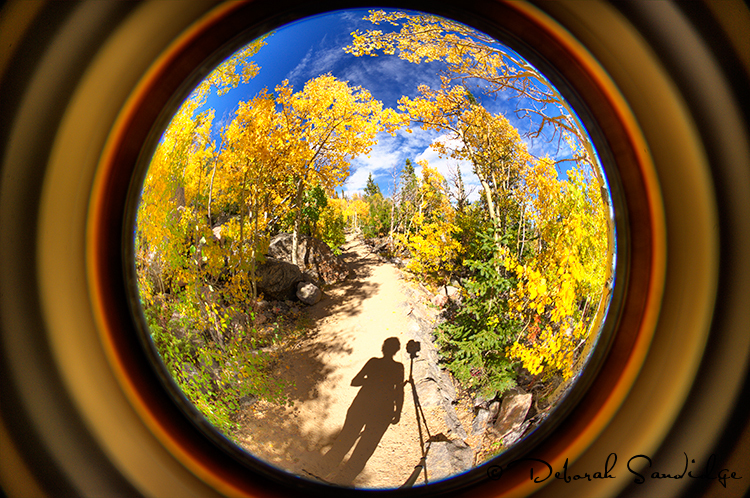 I liked the way the colors looked inside the fisheye lens, kind of fall, kind of cool! So I left it the way it was processed in Photomatix. This was just one of many photographic explorations that day, but one of my favorites! Have fun shooting!